Organic tomatoes straight from the backyard. What to make to preserve their summery essence to enjoy this winter? I’m in over my head, I admit it. Those old school farm wives; how did they get it all done? I suppose it helps to be free of distraction from Blackberries (I don’t mean the tasty kind), cable and high-speed internet and maybe having a workforce of hard-working children helped a little too. Anyway, being the farmer and the wife may just be more than I can handle. Something’s got to give… and so it will. For this year, it will have to be preserves. I just don’t have time for the many consuming preserving projects I managed last year. Instead, I’ve got fences to build, pastures to clear, trees to remove and roofs to mend. Next year we’ll be back in the preserving saddle with produce harvested from our own land – very exciting. But today a welcome rainy Sunday gave me the perfect excuse to catch up with the guilt-inducing tomato stockpile on my porch. Since fancy extras like ketchup and sauce are out, I have to be really selective and spend my time making the one tomato-y thing that will make me the happiest. What might that be?? I’m a girl who likes possibilities, so picking just one of anything is a painful prospect. So, I think back to the darkest days of frigid winter and try to remember what quick, simple home-grown tomato dish gave me the greatest surge of Hope when I really needed it. Hope with a capital H that soon enough the dark, frozen nights will turn gentle, soft and dewy and my porch will once again be filled with buckets of tomatoes, still warm from the garden. Well, that kind of thinking made my decision easy; so easy in fact, no decision-making was necessary. So, here it is, my recipe for Hope. 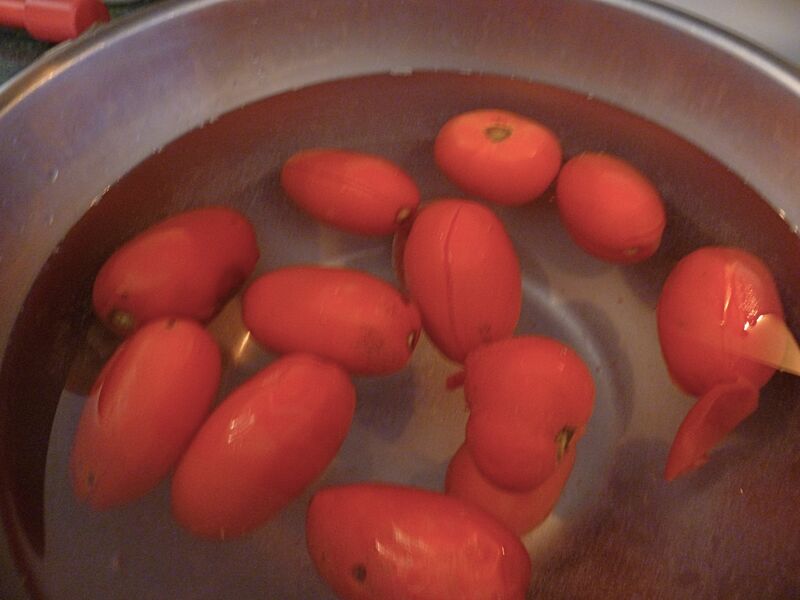 After rinsing and weighing the tomatoes, cut an x in the bottom of each with a sharp knife and toss into a pot of boiling water for a minute to loosen the skins. 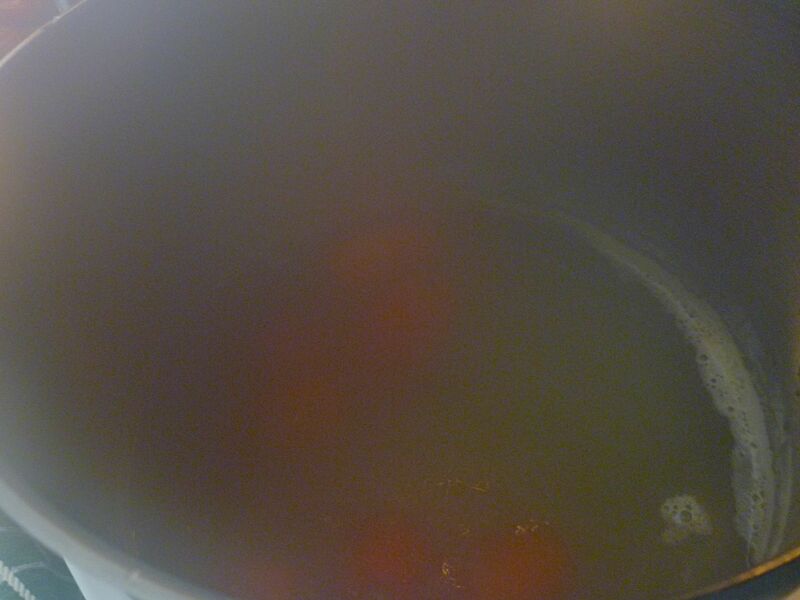 With a slotted spoon, fish tomatoes out of boiling water and drop into cold water. 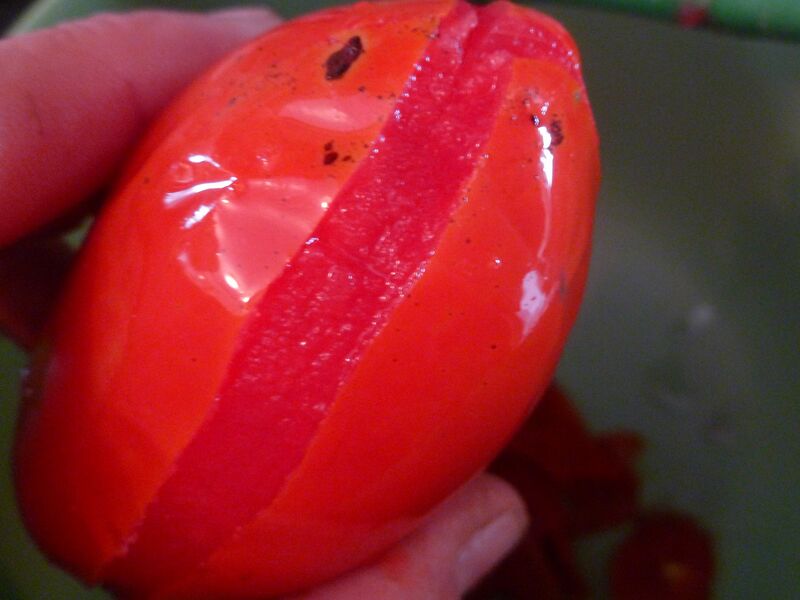 You don’t want to cook the tomatoes, just loosen the skin. The split skins will peel right away – then toss into your food mill. 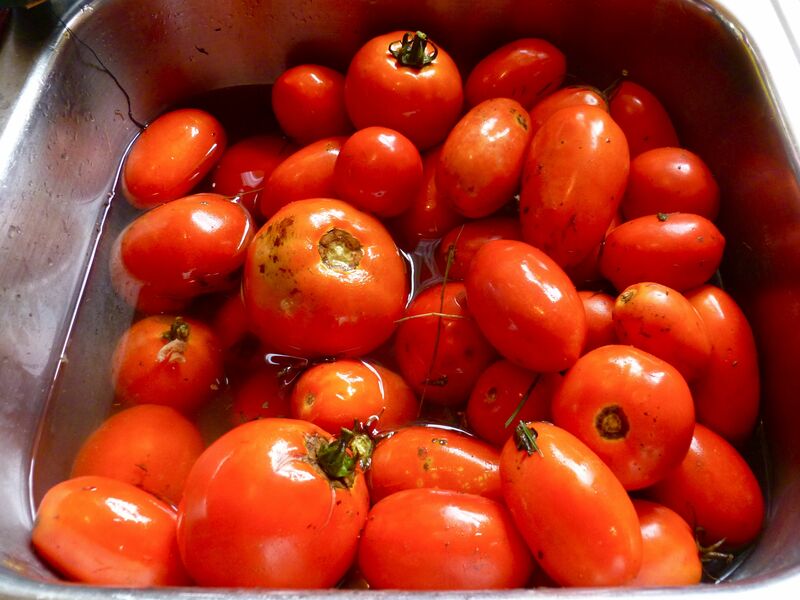 I use a Roma and run the tomatoes through two or three times to extract every last drop… If you don’t have a food mill, just do your best to skin, seed and chop as finely as you can. The texture won’t be exactly the same, but don’t let that stop you – it’s still going to be awesome. The tomatoes after processing. Add kosher salt and ladle into your cheesecloth lined colander. Maybe you’re not like me with large pieces of cheesecloth lying around. Not to worry, you can use a simple cotton dish towel or pillow case but be prepared for it to be forever stained. 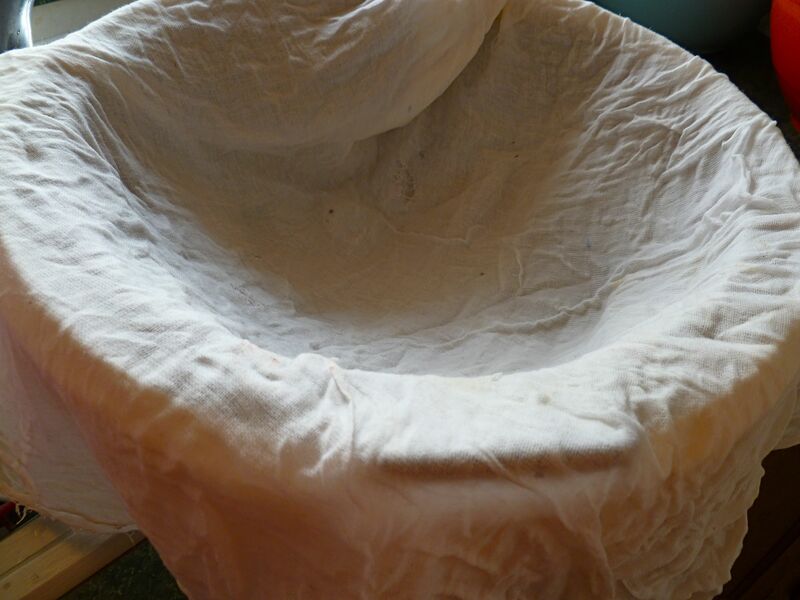 I toss my clean cheesecloth into the boiling water for a few minutes before using. 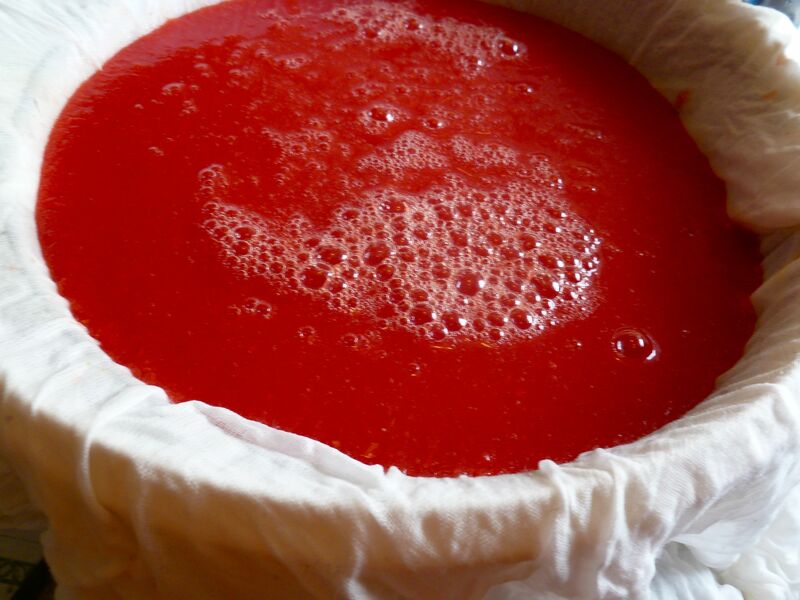 Line a colander with the cheesecloth and you’re ready to pour in your tomato mixture. Place the colander over a large bowl or bucket and drain for at least a couple of hours or overnight. The finished sauce. I freeze this in one cup portions in small freezer bags to use all winter. Thaw it in the bag and gently spoon over cooked pasta tossed with olive oil or butter. If you must heat the sauce, simply warm a little olive oil in a sauce pan and stir in the sauce until just warmed. 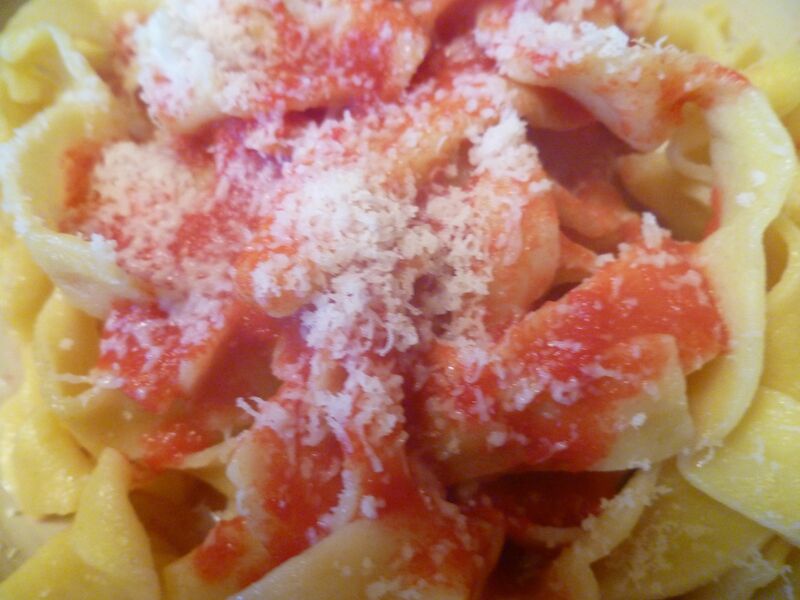 Home made pasta, uncooked fresh tomato sauce frozen from last summer’s harvest and some good quality parmesan or pecorino – perfection in its simplicity! This recipe makes four servings to be eaten right away but is also very simple to repeat as many times as you like ( I just figure out how many pounds of tomatoes I have and work it backwards), throw the milled batches together into one large colander, drain over a large bucket then freeze the concentrated sauce in single serving portions. I store one cup portions in freezer bags. This size will feed the two of us dinner with plenty of leftovers for the next few days. Looking at the chicken scratch I wrote on my recipe, apparently I used 24 pounds of tomatoes last year and today I know it was not nearly enough. A word of warning: a little of this sauce goes a long way. I use 2 or 3 Tablespoons to dress a serving of pasta. Really. Because you are straining away most of the water, the volume will be greatly reduced. I started with a nearly full 5 gallon bucket of tomatoes, and ended up with about 5 cups of sauce. This will vary based on the water content of the tomatoes and the amount of time you leave them drain. Tomato water, tomato essence, plasma – it’s all in the name. This tasty cast off from our sauce is a treasure too! 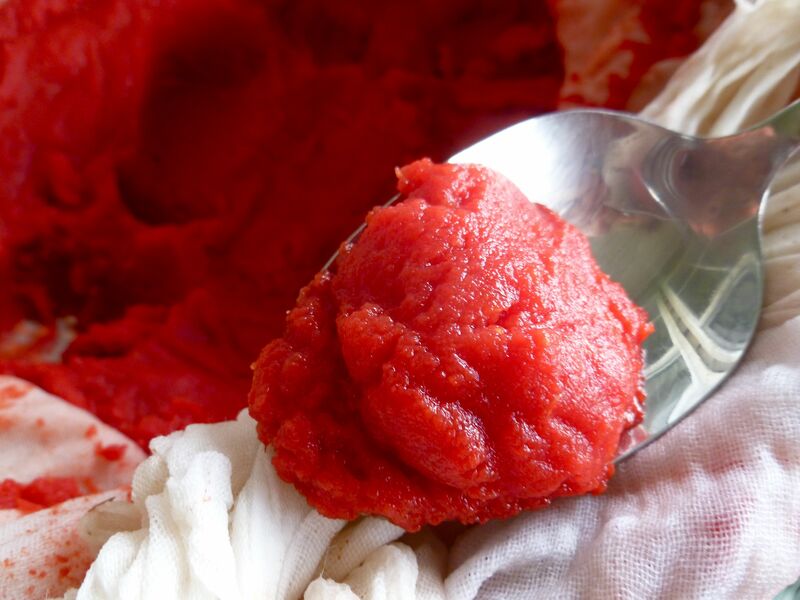 What a treat to whip a container of this out of the freezer for a quick, fresh pasta, pizza or bruschetta that tastes like the tomatoes were literally just picked warm from the summer sun. The only thing that can improve it is home-made pasta and a really good Parmesan or pecorino. Eating a steaming bowl while looking at a foot of snow on the ground outside is guaranteed to give you the encouragement you need to make it through ’till next tomato season, I promise! 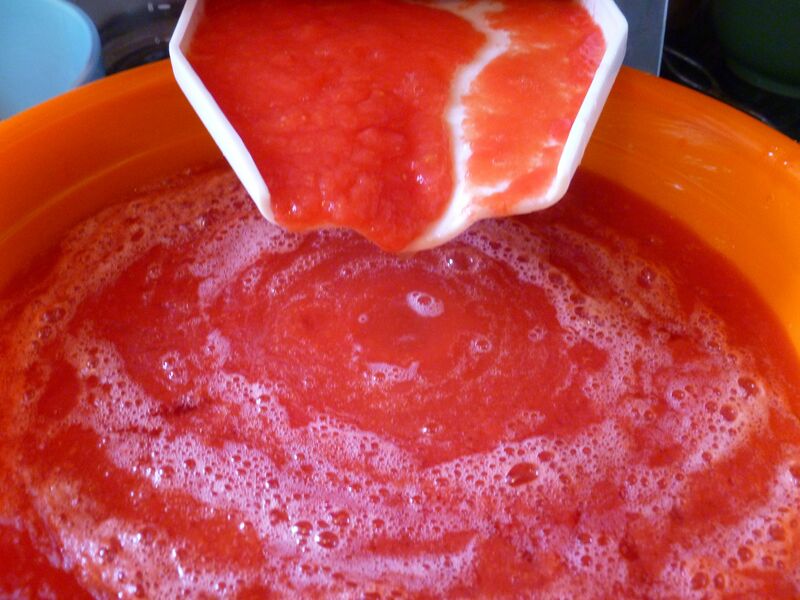 When you’ve finished making this sauce, especially if you made a bunch for freezing, you’ll have lots of nutritious tomato essence (the water left after straining the tomato solids for the sauce) left. If you’ve been reading for a while, you’ll know it’s a thrill for me when the throwaway from one dish can advance to star in another. For example I’m currently smitten with the idea of heirloom tomatoes suspended in tomato water essence from Paul Bertolli’s Cooking by Hand. My relationship with this dish is limited to the mind opening, jaw dropping awe I felt just reading about it in black and white and then, a couple of weeks later the total crush I have on this post with full color photo from Jake when he made it for his inspiring and entertaining blog, Leave Me the Oink. 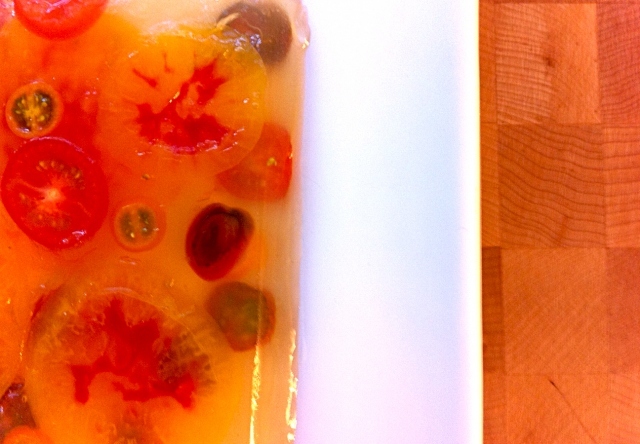 Jake from Leave Me the Oink made these gorgeous heirloom tomatoes suspended in tomato water aspic – WOW! Tell me you’re not impressed! How often will you have all this fresh tomato essence just lying around begging to become an epic dish like Jake’s aspic? Come on, you can do it! Ok, I admit the aspic may be a little ambitious. How about one of these easier but still great summery uses from Sue Veed at SeriousEats.com then? Or, simply use it in place of any liquid next time you make stock, bread, rice, bulgur, barley or risotto. These are kitchen basics you know you’re going to do anyway, so why not add a little free oomph? But, whatever you do, please, please don’t let me find out you poured all that great home-grown organic tomato water down the drain! Thanks for the mention! Great read. I love the idea of using tomato water to poach some shrimp in, followed by a tomato water bloody Mary. That sounds like a fine Sunday morning if you ask me. It was : ) A summer morning in the kitchen isn’t something I get to enjoy often anymore. 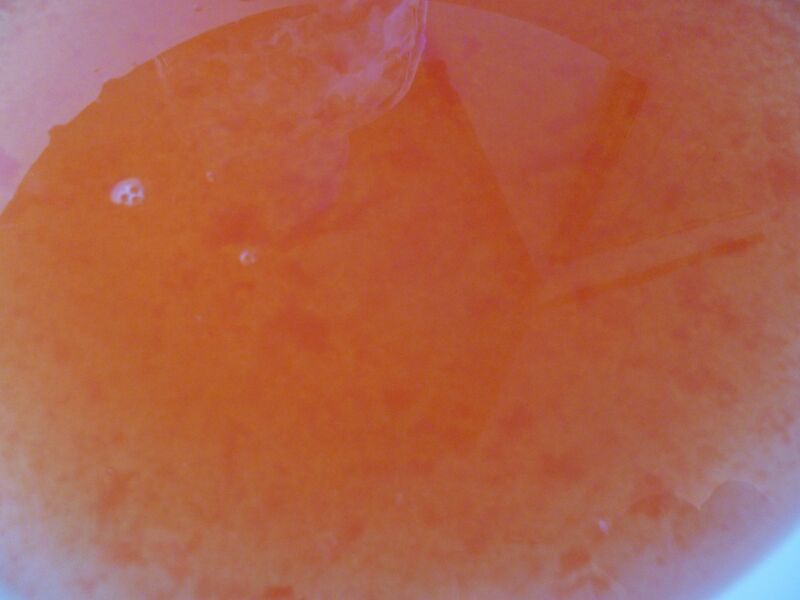 The tomato water was actually really yummy straight up over ice…. I also love that you’re using the tomato water! That aspic looks gorgeous. 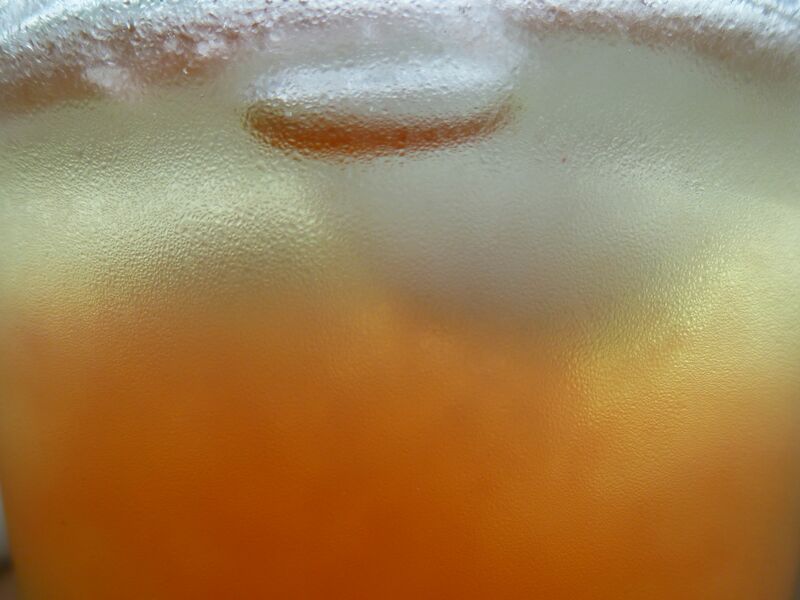 I’m hooked – it’s totally refreshing over ice! Brilliant, just tweeted and facebook loved this. I’ve spent so many hours reducing tomato sauce then thought “why didn’t I just strain it before I cooked?” This no cook method is even better. thanks for sharing with Simple Lives! Thanks so much for reading – I’m glad it was helpful! I think garden ripened tomatoes are about as perfect as it gets so I hate to lose the freshness by cooking it down. Although I love me some heavy meaty sauce too…. Give this a try, you’ll be glad you did! Wow–that was inspiring. Going to check those last few tomato plants in the backyard today! Glad to give you a little boost Sue. My tomatoes are still coming… now, what will I do with the green ones?